Joey Arias as Joan Crawford. Photo: Jim Moore. That famous theater critic, Karl Marx, once observed that, “history repeats itself, first as tragedy, then as farce.” This maxim certainly holds true when it comes to the two Joan Crawford-inspired drag revivals currently enjoying holiday runs downtown. At the Connelly Theatre, John Epperson, as Lypsinka, has been busy portraying a haunted and haunting Joan in his 2005 cult favorite, The Passion of The Crawford . And now, over at the Abron Arts Center, Joey Arias, along with a veritable dusty grab bag of drag queen veterans, are offering up the 1993 chestnut, Christmas With the Crawfords. It’s an absurd and one dimensional romp full of holiday caroling and tearing up of scenery. What plot there is revolves around Ms. Crawford prepping for her infamous 1940’s Christmas Eve radio broadcast, but essentially the show is a 90 minute parade of famous movie stars dropping by unannounced to sing, dance, and generally toss each other around. You know the gang: Gloria Swanson, Ethel Merman, Carmen Miranda, and even the Andrew Sisters, who do a nice little ditty about spending Hanukkah in Santa Monica. Arias has a 30 year history of some pretty amazing solo performances, most notably his Arias With A Twist which he co-created with famed puppeteer Basil Twist. But this sort of musical schtick is not really his forte. With a strained voice and a notable lack of subtlety, his Crawford could be just about any mean mom of the Hollywood Hills. Except, of course, when he dances. Arias’ legs are impossibly long and sinewy. His Crawford makeup meanwhile has been applied with a trowel and his wig seems to be hiding a giant yuletide log. So when he throws open his gown to do some wild high heeled hoofing, it’s like watching Cyd Charisse from the waist down, and Herman Munster from the neck up. And speaking of monsters, the drag great Keith Levy (a.k.a. Sherry Vine) appears as the classic Bette Davis villainess, Baby Jane Hudson. Baby Jane is now suffering the indignity of being Crawford’s servant. Levy nails the Davis impersonation and is quite funny in delivering some of her classic lines. But, a scene between him and Arias, which should be a killer spoof of Whatever Happened to Baby Jane?, never quite comes to fruition. The comic timing is off between these two solo performers, neither willing to give over the stage to the other. On the night I visited, Christina Crawford was played by the understudy, Chris Mirto. My hunch is that Mirto, who studied at the Stella Adler Studio and holds an MFA in directing from the Yale School of Drama, turns in a much different performance than the regular cast member, Chris March, a fashion designer best known for his appearances on Project Runway. Sporting more beard stubble than any man portraying a 10-year-old girl should, Mirto nonetheless does a solid job. He executes a few hilarious pratfalls and brings a properly humorous anguish to Christina’s horrific childhood. It also helps that he comes up to about the height of Arias’ kneecaps. Judy Garland (Connie Champagne) drops by, although it seems she is in some different, and better, production. Ms. Champagne has made a career of imitating Garland, and while not really resembling her physically (especially here with red hair), she transforms herself as if by sheer will into a dead-on doppelganger and offers the night’s most nuanced and loving portrayal. She is given every chance to steal the show and essentially does so with her eleven o’clock number, Have Yourself a Merry Little Christmas. So, as Judy, or Karl Marx, might have put it, if not all of the show’s troubles are out of sight, hearts are light, faithful friends are near to us, and the troupe does muddle through somehow. Christmas With the Crawfords – created by Richard Winchester and written by Mark Sargent; Directed by Donna Drake. WITH: Joey Arias (Joan Crawford) Connie Champagne (Judy Garland), Sherry Vine/Keith Levy (Hedda Hopper, Baby Jane Hudson), Flotilla DeBarge (Hattie McDaniel), Chris March (Christina Crawford), (Adam Davidson (Christopher Crawford), Garrit Gaudan (Liberace), Vodka Stinger (LeVerne Andrews, Edith Head), Jason B. Schmidt (Patty Andrews, Gloria Swanson), Brett-Marco Glauser (Maxene Andrews, Carmen Miranda). 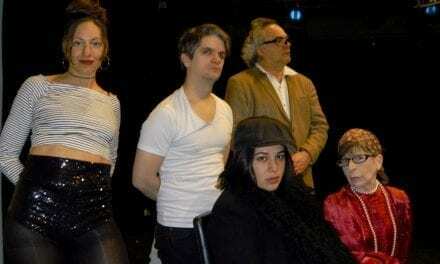 Scenic design by Andrea Purcigliotti, lighting design by Lauren Miller; costumes by Chris March; Garrit Guadan, music director, Christopher Mirto, stage manager; at the Abrons Arts Center, 466 Grand Street, 212.598.0400, Through December 27th, http://www.abronsartscenter.org , Running time: 90 minutes.